Assurance that refrigerated product stays refrigerated! 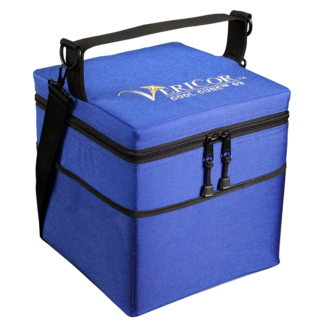 A Cool Cube™ at Refrigerated Temperatures is not an ordinary transport cooler (vaccine and medicine carrier). It is an easy-to-carry, qualified container and pack-out system that keeps temperature sensitive product (fresh vaccine, medicine) chilled between 2° and 8°C for over 2.5 days – without using ice or electricity! This cooler is ideal for transport, but also excels at protecting valuable product during off-site use and power outages, regardless of hot or freezing conditions. The simplified, validated, patented technology is the best compact thermal protection product available to maintain the cold chain! Transport & Storage Coolers @ Refrigerated Temps for Vaccine, Medicine, etc.